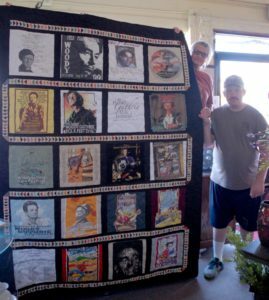 Want a chance to win this year’s quilt? Enter now! The quilt, created by Linda Rasure (pictured with her son, Will) with t-shirts donated by Cheryl Graham, has one t-shirt from ALL 20 YEARS!!! Get your chance at this one-of-a-kind quilt today! This quilt will be given away at the Pastures of Plenty on July 14th at 9 p.m. Follow this link below to purchase your raffle ticket. $5 each or 5 for $20! Raffle winner need not be present to win.